well-defined crystal structure and a CuSSCu core having two equatorial histidine ligands, His120 and His46. The mutations His120Asn and His120Gly were made at the equatorial His120 ligand to understand the histidine-related modulation to CU^sub A^, notably to the valence delocalization over the CuSSCu core. For these His120 mutants Q-band electron nuclear double resonance (ENDOR) and multifrequency electron paramagnetic resonance (EPR) (X, C, and S-band), all carried out under comparable cryogenic conditions, have provided markedly different electronic measures of the mutation-induced change. Q-band ENDOR of cysteine C^sub beta^ protons, of weakly dipolar-coupled protons, and of the remaining His46 nitrogen ligand provided hyperfine couplings that were like those of other binuclear mixed-valence CUA systems and were essentially unperturbed by the mutation at His120. The ENDOR findings imply that the CUA core electronic structure remains unchanged by the His120 mutation. On the other hand, multifrequency EPR indicated that the H120N and H120G mutations had changed the EPR hyperfine signature from a 7-line to a 4-line pattern, consistent with trapped-valence, Type 1 mononuclear copper. The multifrequency EPR data imply that the electron spin had become localized on one copper by the His120 mutation. To reconcile the EPR and ENDOR findings for the His,120 mutants requires that either: if valence localization to one copper has occurred, the spin density on the cysteine sulfurs and the remaining histidine (His46) must remain as it was for a delocalized binuclear CU^sub A^ center, or if valence delocalization persists, the hyperfine coupling for one copper must markedly diminish while the overall spin distribution on the CuSSCu core is preserved. Cu^sub A^ in cytochrome c oxidase was recognized even in the 1970s as having unusual electronic properties (Beinert, 1997), for example, by its small histidine and Cys C^sub beta^ proton hyperfine couplings (Stevens et al., 1982; van Camp et al., 1978) and by its small copper hyperfine couplings resolved at S-band (Froncisz et al., 1979). Subsequently, the marked similarities between the Cu^sub A^ center of cytochrome oxidase and the binuclear copper of nitrous oxide reductase in their low frequency, seven-line EPR pattern (Antholine, 1997; Karpefors et al., 1996; Kroneck et al., 1990) and in the considerable homology of sequence near the copper binding sites (Zumft et al., 1992; Zumft and Kroneck, 1996) all pointed to CU^sub A^ as a binuclear, mixed-- valence [Cu(1.5)...Cu(1.5)] center. Mixed-valency will arise when there is a large exchange coupling that delocalizes an unpaired valence electron throughout the CuSSCu core and when this coupling is larger than vibronic, Jahn-Teller-like interactions or any local copper site differences that tend to valence-trap spin on one of the coppers (Farrar et al., 1996; Schatz, 1980). The purple Cu^sub A^ center was firmly established as a binuclear, mixed-valence complex through biophysical (Blackburn et al., 1994; Farrar et al., 1995; Greenwood et al., 1983; Kroneck et al., 1990), biochemical (Dennison et al., 1995; Hay et al., 1996; Stutter et al., 1996; van der Oost et al., 1992), and x-ray crystallographic study (Iwata et al., 1995; Robinson et al., 1999; Tsukihara et al., 1995; Williams et al., 1999; Wilmanns et al., 1995). The Cu^sub A^ center (called Cu^sub A^-azurin hereafter) as engineered by loop-directed mutagenesis into Pseudomonas aeruginosa azurin (Hay et al., 1996, 1998) provided high resolution (1.65 A) to the structure of Cu^sub A^ in a protein, whereby bond distances to weaker axial ligands and to equatorial histidine ligands were obtained along with the tilt of the histidine imidazole planes. (A schematic of the locale of the Cu^sub A^ centers from wild-type CU^sub A^-azurin is shown in Fig. 1.) One histidine ligand (Hisl20/H120) conspicuously showed both a longer bond distance and a larger out-of-plane tilt than the other histidine (His46/H46), and the copper that coordinated His120 also happened to be the recipient of a short bond to a carbonyl oxygen, whose Cu-oxygen bond length was little different from the His120-to-Cu bond distance. The existence of two detectable and structurally slightly different CuA centers within the wild-type Cu^sub A^-azurin crystal with different Cu-His120 bond lengths was resolved, as indicated in Fig. 1. Wild-type CUA-azurin showed the typical 7-line EPR pattern characteristic of mixed-valence [Cu(1.5)..Cu(1.5)] copper (Hay et al., 1998). As observed from crystal structures of recombinant and native CU^sub A^ systems (Iwata et al., 1995; Tsukihara et al., 1995; Wilmanns et al., 1995; Robinson et al., 1999), the axial ligand distance, Cu-Cu bond distance, and equatorial histidine nitrogen bonding are interdependent (Farrar et al., 1996, Gamelin et al., 1998). Furthermore, they are coupled to the electron transfer function of the site by their affect on the reduction potential, bonding, reorganization energy, and electronic structure of the copper center. In an effort to modulate the bonding of the equatorial ligand, and thus vary the axial ligand interaction and Cu-Cu bonding, His 120 was mutated to asparagine and glycine in Cu^sub A^ azurin (Wang et al., 1999; Berry et al., 2000). ENDOR-EPR measurements are relevant to this biological electron transfer function and bonding because they provide an experimental measure of electron delocalization and an experimental measure of impaired spin density on the cysteine and histidine ligands through which electron transfer may occur. Multifrequency EPR and Q-band ENDOR studies were done to identify the underlying electronic structural character of Cu^sub A^-azurin and its His120 mutants and to identify the role of His 120 in altering this electronic structural character (Berry et al., 2000; Wang et al., 1999). The CU^sub A^-azurin, its Hisl20Asn (H120N) and Hisl20Gly (H120G) mutants, and Type 1 azurin per se were expressed, prepared, and characterized as described previously (Hay et al., 1996; Wang et al., 1999). The concentration of these samples was ~1 mM, and they were dissolved in 50% glycerol, 0.1 M phosphate buffer, pH 5.2. Beef heart cytochrome C (aa3) oxidase was prepared as described previously (Fan et al., 1988). Copper-- substituted liver alcohol dehydrogenase in the presence of NADH (Maret and Kozlowski, 1987) was prepared by C. T. Martin. ENDOR experiments were carried out at Q-band (Sienkiewicz et al., 1996) under cryogenic, pumped helium rapid passage conditions as outlined previously (Veselov et al., 1998). Cryogenic multifrequency EPR spectra at S, C, and X-band were taken and analyzed at the National Biomedical ESR Center (Antholine, 1997). Loop-gap resonators and low frequency microwave bridges designed and built at the National Biomedical ESR Center (Medical College of Wisconsin, WI) were used at S- and C-band (Froncisz and Hyde, 1982). The temperature for multifrequency EPR was controlled with a helium flow system (Air Products, Allentown, PA). A Gaussmeter (Rawson-Lush Instrument, Inc., Acton, MA) was used to calibrate the magnetic field and an EIP Model 548 frequency counter used to measure the microwave frequency. The wild-type CU^sub A^-azurin system, although engineered into a Type 1 copper azurin through loop-directed mutagenesis, showed intimate electronic structure and hyperfine information from its cysteines, histidine, and copper, which are highly typical of the CU^sub A^ of naturally occurring systems. The characteristics of the Cys C^sub beta^ proton and histidine hyperfine couplings that reflected specific covalency of the CuSSCu core, as well as the weak proton couplings that qualitatively reflected overall spin distribution, remained essentially unchanged among CuC^sub A^-azurin and its H120N and H120G mutants. The ENDOR findings and UV-Vis (Berry et al., 2000; Wang et al., 1999) information would imply that the core electronic structure remains unchanged among Cu^sub A^-azurin and its H120N and H120G mutants. Multifrequency EPR at similar cryogenic temperatures to those of ENDOR showed that the His120 mutations led to an increase in gi (2.17-2.23) and a copper hyperfine pattern that diminished from the seven lines expected from mixed-- valence copper to no more than four copper features in a manner that might be expected from trapped-valence mononuclear copper. These results indicate that the His120 ligand plays a subtle role in modulation of electronic structure of the Cu^sub A^ center and different spectroscopic techniques are required to fully understand the effect of the mutation. If the magnitude of the copper hyperfine coupling and the presence of fewer lines indicates smaller spin density and only one copper, then there would have to be a vast rearrangement of electron spin density for the His120 mutants. One could postulate that while one copper was losing spin, the other could concurrently gain it in the course of valence localization; the net population of spin on the cysteine sulfur could then conceivably stay constant in the process. 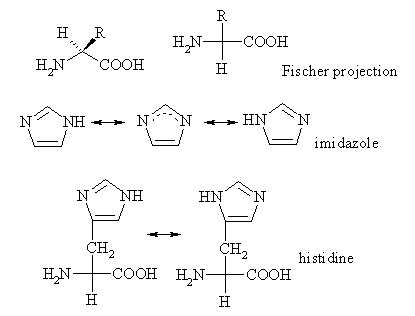 However, this explanation would also need to postulate a change of conformation of the remaining histidine (His46) to explain why the nitrogen hyperfine coupling to that nonmutated histidine, which should be located next to the copper with spin to account for hyperfine coupling to 14 N of His46, should stay constant. Conversely, if it were to be supposed that the His120 mutants are mixed-valent, then there would need to be a marked change in the Cu hyperfine coupling for one copper, while the spin density throughout the overall CuSSCu site remained unchanged. We are left with a puzzle for the His120 mutants to explain both the constancy of the overall electronic spin distribution implied by ENDOR and the localization of spin on one copper implied by multifrequency EPR. The explanation of the puzzle may require theory at the present state of the art (Gamelin et al., 1998; Neese, 1997), and indeed be a test of that theory, to accurately calculate ligand and metal Fermi and dipolar hyperfine contributions for a CuA that explicitly lacks one histidine. This work was supported by the National Institutes of Health Grant GM-35103 (to C.P.S.) and National Science Foundation CHE95-02421 (to Y.L.). W.E.A. was supported by National Institutes of Health RRO1008 to J.S. Hyde. Y.L. also acknowledges the Camille and Henry Dreyfus Foundation for the Camille Dreyfus Teacher-Scholar award. We are grateful to Dr. C.T. Martin, now Prof. of Chemistry, University of Massachusetts, Amherst, for providing the CuLADH sample made in the presence of NADH. Antholine, W. E. 1997. Evolution of mononuclear to binuclear CUA: an EPR study. Adv. Biophys. Chem. 6:217-246. Atherton, N. M. 1973. Electron Spin Resonance. Wiley, New York. Beinert, H. 1997. Copper A of cytochrome c oxidase, a novel, long-- embattled, biological electron-transfer site. Eur. J. Biochem. 245: 521-532. Vries. 1994. Metal-metal bonding in biology: EXAFS evidence for a 2.5 A copper-copper bond in the CuA center of cytochrome oxidase. Biochemistry. 33:10401-10407. Dennison, C., E. Vijgenboom, S. de Vries, J. van der Oust, and G. W. Canters. 1995. Introduction of a CuA site into the blue copper protein amicyanin from Thiobacillus versutus. FEBS Lett. 365:92-94. Fan, C., J. Bank, R. Dorr, and C. P. Scholes. 1988. An electron nuclear double resonance (ENDOR) investigation of redox-induced electronic structural change at CuC^sub A^^sup ++^ in cytochrome c oxidase. J. Am. Chem. Soc. 263:3588-3591. Farrar, J. A., P. Lappalainen, W. G. Zumft, M. Saraste, and A. J. Thomson. 1995. Spectroscopic and mutagenesis studies on the Cu^ center from the cytochrome-c oxidase complex of Paracoccus denitrificans. Eur. J. Biochem. 232:294-303. Farrar, J. A., F. Neese, P. Lappalainen, P. M. H. Kroneck, M. Saraste, W. G. Zumft, and A. J. Thomson. 1996. The electronic structure of CUA: a novel mixed-valence dinuclear copper electron-transfer center. J. Am. Chem. Soc. 118:11501-11514. Froncisz, W., and J. S. Hyde. 1982. The loop-gap resonator: a new microwave lumped circuit ESR sample structure. J. Magn. Reson. 47: 515-521. Froncisz, W., C. P. Scholes, J. S. Hyde, Y. H. Wei, T. E. King, R. W. Shaw, and H. Beiner. 1979. Hyperfine structure resolved by 2 to 4 GHz EPR of cytochrome c oxidase. J. Biol. Chem. 254:7482-7484. Gamelin, D. R., D. W. Randall, M. T. Hay, R. P. Houser, T. C. Mulder, G. W. Canters, S. de Vries, W. B. Tolman, Y. Lu, and E. 1. Solomon. 1998. Spectroscopy of mixed-valence C^sub A^-type centers: ligand-field control of ground-state properties related to electron transfer. J. Am. Chem. Soc. 120:5246-5263. Greenwood, C., B. C. Hill, D. Barber, D. G. Eglinton, and A. J. Thomson. 1983. The optical properties of CuA in bovine cytochrome c oxidase determined by low-temperature magnetic-circular-dichroism spectroscopy. Biochem. J. 215:303-316. Gurbiel, R. J., Y. C. Farm, K. K. Surerus, M. M. Werst, S. M. Musser, P. E. Doan, S. I. Chan, J. A. Fee, and B. M. Hoffman. 1993. Detection of two histidyl ligands to CuA of cytochrome oxidase by 35-GHz ENDOR: 14,isN and 63,65 Cu ENDOR studies of the CuA site in bovine heart cytochrome aa3 and cytochromes caa3 and ba3 from Thermus thermophilus. J. Am. Chem. Soc. 115:10888-10894. Hay, M., J. H. Richards, and Y. Lu. 1996. Construction and characterization of an azurin analog for the purple copper site in cytochrome c oxidase. Proc. Natl. Acad. Sci. U.S.A. 93:461-464. Hay, M. T., M. C. Ang, D. R. Gamelin, E. I. Solomon, W. E. Antholine, M. Ralle, N. J. Blackburn, P. D. Massey, X. Wang, A. H. Kwon. 1998. Spectroscopic characterization of an engineered purple CUA center in azurin. Inorg. Chem. 37:191-198. Hoffman, B. M., V. J. DeRose, P. E. Doan, R. J. Gurbiel, A. L. P. Housman, and J. Telser. 1993. In Biological Magnetic Resonance Vol. 13: EMR of Paramagnetic Molecules. L.J. Berliner and J. Reuben, editors. Plenum, New York. Iwata, S., C. Ostermeier, B. Ludwig, and H. Michel. 1995. Structure at 2.8 A resolution of cytochrome c oxidase from Paracoccus denitrificans. Nature. 376:660-669. Karpefors, M., C. E. Slutter, J. A. Fee, R. Aasa, B. Kjellebring, S. Larsson, and T. Vanngard. 1996. Electron paramagnetic resonance studies of the soluble CuA protein from the cytochrome ba3 of Thermos thermophilus. Biophys. J. 71:2823-2829. Kroneck, P. M. H., W. E. Antholine, D. H. W. Kastrau, G. Buse, G. C. M. Steffens, and W. G. Zumft. 1990. Multifrequency EPR evidence for a bimetallic center at the CuA site in cytochrome c oxidase. FEBS Lett. 268:274-276. Luchinat, C., A. Soriano, K. Djinovic-Carugo, M. Saraste, B. G. Malmstrom, and I. Bertini. 1997. Electronic and geometric structure of the CuA site studied by 'H NMR in a soluble domain of cytochrome c oxidase from Paracoccus denitrificans. J. Am. Chem. Soc. 119: 11023-11027.
spectroscopy of copper alcohol dehydrogenase: pink, violet and green forms of a Type I copper center analog. Biochim. Biophys. Acta. 912:329-337. McDowell, C. A., A. Naito, D. L. Sastry, Y. U. Cui, K. Sha, and S. X. Yu. 1989. Ligand ENDOR study of copper (II)-doped L-histidine deuterochloride monodeuterohydrate single crystals at 4.2 K. J. Mol. Struct. 195:361-381. Neese, F. 1997. Electronic structure and spectroscopy of novel copper chromophores in biology. Ph.D. thesis. Universitat Konstanz, Germany. Neese, F., R. Kappl, J. Huttermann, W. G. Zumft, and P. M. H. Kroneck. 1998. Probing the ground state of the purple mixed valence CuA center in nitrous oxide reductase: a CW ENDOR (X-band) study of the 65 Cu, ESN-histidine labeled enzyme and interpretation of hyperfine couplings by molecular orbital calculations. J. Biol. Inorg. Chem. 3:53-67. Neese, F., W. G. Zumft, W. E. Antholine, and P. M. H. Kroneck. 1996. The purple mixed-valence CUA center in nitrous-oxide reductase: EPR of the copper-63-, copper-65-, and both copper-65- and [15N]histidineenriched enzyme and a molecular orbital interpretation. J. Am. Chem. Soc. 118:8692-8699. Ramaswamy, S., M. el Ahmad, O. Danielsson, H. Jornvall, and H. Eklund. 1996. Crystal structure of cod liver class I alcohol dehydrogenase: substrate pocket and structurally variable segments. Protein Sci. 5:663-671. Robinson, H., M. C. Ang, Y.-G. Gao, M. T. Hay, Y. Lu, and A. H. J. Wang. 1999. Structural basis of electron transfer modulation in the purple CuA center. Biochemistry. 38:5677-5683. Schatz, P. N. 1980. A vibronic coupling model for mixed-valence compounds and its application to real systems. In Mixed Valence Compounds. R.D. Brown, editor. D. Reidel, Dordrecht, The Netherlands. 115-150. Sienkiewicz, A., B. G. Smith, A. Veselov, and C. P. Scholes. 1996. Tunable Q-band resonator for low temperature electron paramagnetic resonance/electron nuclear double resonance measurements. Rev. Sci. Instrum. 67:2134-2138. Slutter, C. E., D. Sanders, P. Wittung, B. G. Malmstrom, R. Aasa, J. H. Richards, H. B. Gray, and J. A. Fee. 1996. Water-soluble, recombinant Cu^-domain of the cytochrome ba3 subunit II from Thermus thermophilus. Biochemistry. 35:3387-3395. Solomon, E. L, M. J. Baldwin, and M. D. Lowery. 1992. Electronic structures of active sites in copper proteins: contributions to reactivity. Chem. Rev. 92:521-542. Stevens, T. H., C. T. Martin, H. Wang, G. W. Brudvig, C. P. Scholes, and S. I. Chan. 1982. The nature of CuA in cytochrome c oxidase. J. Biol. Chem. 257:12106-12113. Tsukihara, T., H. Aoyama, E. Yamashita, T. Ton-dzaki, H. Yamaguchi, K. Shinzawa-Itoh, R. Nakashima, R. Yaono, and S. Yoshikawa. 1995. Structures of metal sites of oxidized bovine heart cytochrome c oxidase at 2.8 k. Science. 269:1069-1074. ENDOR from the 'copper' EPR signal. Biochim. Biophys. Acta. 537: 238-246.
van der Oost, J., P. Lappalainen, A. Musacchio, A. Warne, L. Lemieux, J. Rumbley, R. B. Gennis, R. Aasa, T. Pascher, B. G. Malmstrom. 1992. Restoration of a lost metal-binding site: construction of two different copper sites into a subunit of the E. coli cytochrome o quinol oxidase complex. Embo J. 11:3209-3217. Veselov, A., K. Olesen, A. Sienkiewicz, J. P. Shapleigh, and C. P. Scholes. 1998. Electronic structural information from Q-band ENDOR on the Type 1 and Type 2 copper liganding environment in wild-type and mutant forms of copper-containing nitrite reductase. Biochemistry. 37: 6095-6105. Wang, X., S. M. Berry, Y. Xia, and Y. Lu. 1999. The role of histidine ligands in the structure of purple CuA azurin. J. Am. Chem. Soc. 121:7449-7450. Werst, M. M., C. E. Davoust, and B. M. Hoffman. 1991. Ligand spin densities in blue copper proteins by Q-band 'H and 14 N ENDOR spectroscopy. J. Am. Chem. Soc. 113:1533-1538. Williams, P. A., N. J. Blackburn, D. Sanders, H. Bellamy, E. A. Stura, J. A. Fee, and D. E. McRee. 1999. The CuA domain of Thermus thermophilus ba3-type cytochrome c oxidase at 1.6 A resolution. Nat. Struct. BioL 6:509-516. Wilmanns, M., P. Lappalainen, M. Kelly, E. Sauer-Eriksson, and M. Saraste. 1995. Crystal structure of the membrane-exposed domain from a respiratory quinol oxidase complex with an engineered dinuclear copper center. Proc. Natl. Acad. Sci. U. S. A. 92:11955-11959. Zumft, W. G., A. Dreusch, S. Lochelt, H. Cuypers, B. Friedrich, and B. Schneider. 1992. Derived amino acid sequences of the nosZ gene (respiratory NZO reductase) from Alcaligenes eutrophus, Pseudomonas aeruginosa, and Pseudomonas stutzeri reveal potential copper-binding residues: implications for the CuA site of N20 reductase and cytochrome-c oxidase. Eur. J. Biochem. 208:31-40. Zumft, W. G., and P. M. H. Kroneck. 1996. Metal-center assembly of the bacterial multicopper enzyme, nitrous oxide reductase. Adv. Inorg. Biochem. 11:193-221. Submitted November 17, 2001, and accepted for publication February 13, 2002. Dr. Lukoyanov is on leave from the MRS Laboratory, Kazan State University, 420008, Kazan, Russian Federation. Address reprint requests to Dr. Charles P. Scholes, Department of Chemistry, University at Albany, SUNY, Albany, NY 12222. Tel: 518-442-- 4551; Fax: 518-442-3462; E-mail: cps14@ albany.edu.